It had a very successful Indiegogo campaign that raised 12 times their campaign goal AND delivered the product on time (in fact, ahead of schedule for some users). Love the blog! I bought this (on B&H) based on seeing it here, and the livestreaming is fantastic. The camera is relatively low-end otherwise, but it's small, inexpensive, and has some nice tricks up its sleeve. FWIW, a Pixel XL only does 2560 x 1280 video, so the group allowed higher resolution must be quite limited indeed. If someone could only buy one camera in this price range, I still recommend the LG 360, which I think is a fantastic value and extremely pocketable, but for livestreaming on Android, this is the only game in town. Cute, functional, well-built, and inexpensive. Hi Joe. Hmm the Pixel XL is limited to 1280p? That's unexpected… Have you tried checking the options to see if there's a 1504p setting? 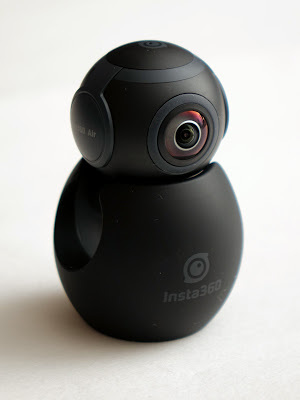 As for the LG 360 Cam, yes it's a decent camera too, but in a couple of weeks Insta360 Air and Nano will add realtime image stabilization, which would make them even better and arguably the best consumer 360 cameras.